By coming along to The Sit Down Comedy Club at 7pm on Sunday 21 October, you’ll be doing your bit to help raise funds to reduce the burden of Cancer for Queenslanders. 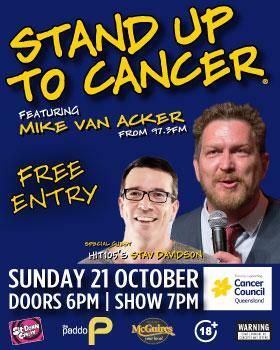 Stand Up To Cancer is a FREE night of comedy that supports the amazing work of Cancer Council Queensland (CCQ). CCQ raises funds that are dedicated to improving the quality of life for people living with cancer, through research, patient care, prevention and early detection. Their vision is for a cancer free future. Help us to achieve this future by grabbing a bunch of mates and coming along to see comedians Mike Van Acker (97.3FM’s Breakfast with Bianca Mike & Bob), Steven J. Whiteley, Jenny Wynter, Michael Toon, Ting Lim, Aaron Pratt, Anthony Walsh, Jessica Sharrock and Special Guest, Stav Davidson from Hit105, take to the stage in aid of Cancer research. Entry is free, but we will be kindly asking for donations on the night (This means bring cash. Lots and lots of cash). Hurry! This event WILL book out, so grab your tickets today by calling the Sit Down Comedy Club Box Office on 07 3369 4466. To find out more about the great work of CCQ, head to www.cancerqld.org.au. CCQ is a member of Cancer Council Australia and work in global affiliation with the Union for International Cancer Control (UICC).